Eichner played Harrison Wilton (and Tex Watson) in last year's American Horror Story: Cult (Season 7) and will be returning for Apocalypse. The news of Lange's return was broken by fellow American Horror Story alum and staple Sarah Paulson during a stop on the TCA summer press tour. 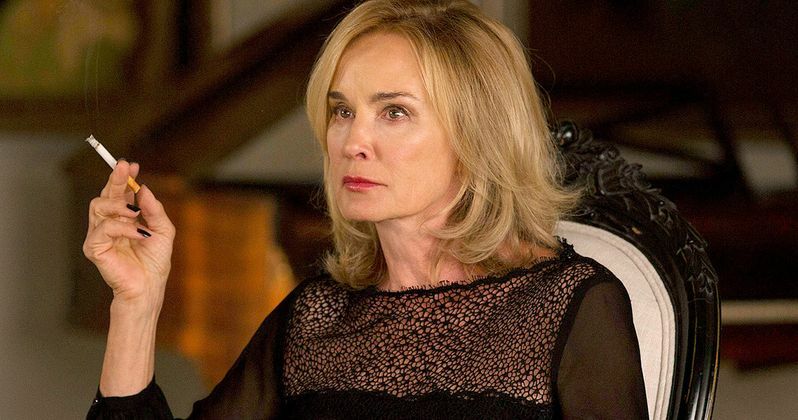 Lange will be reprising the role of Constance Langdon, the next-door neighbor of the Harmon family in Murder House. In additional to Lange and Paulson, cast members confirmed for Season 8 include Evan Peters, Kathy Bates, Billie Lourd, Adina Porter, Joan Collins, Jeffrey Bowyer-Chapman, Kyle Allen, and Cody Fern. The news of Lange's return to the fold was accompanied by news that American Horror Story has been confirmed for a 10th Season, meaning we can count on the series sticking around until (at least) 2020! In addition to playing Langdon in Season 1, Lange portrayed Sister Jude Martin in Season 2 (Asylum), Fiona Goode in Season 3 (Coven), and Elsa Mars in Season 4 (Freak Show); she received Emmys for Langdon and Goode. While Murphy and his extremely talented ensemble casts have delivered quality (and terrifying) storylines in her absence, Lange's return is certain to give the franchise a shot in the arm, hopefully allowing it to avoid the cooling that's hit its horror peer The Walking Dead in recent seasons. Indeed, any series that lasts more than 5 seasons is in serious danger of becoming stale, but the fact that each chapter of American Horror Story tells a unique tale in a bevy of eras and locations has allowed it to remain both fresh and versatile. Murphy and his creative team can craft each season to capitalize on popular trends (reality TV and crime documentaries in Season 6, Roanoke) and current events (the US presidential election in Season 7, Cult). While the impending crossover will obviously tread familiar territory, there's no telling where the show will go next. Maybe, someday, they'll even do an entire season about Aliens (hint, hint). As for what we can expect when worlds collide in Apocalypse, Ryan and his producers have been mum so far, though executive producer Alexis Martin Woodall offered this opaque yet fascinating synopsis: "The story begins with the end of the world and then our world begins!" This news first appeared over at Entertainment Weekly.